A garden design by Frank Kershaw, used as a sample in his recent class at the Toronto Botanical Gardens, March, 2015.
brochures (and snaps you’ve taken) from garden design centres such as the Unilock Outdoor Idea Centre. Take photos of your house on an angle. Don’t bother with straight-on shots. Instead, stand at the corners of your property, taking shots at “an oblique diagonal” to get images that give you a more “3D” image. Have the photos made into large prints. Draw directly on the photos or use tracing paper to try out ideas before you get down to drawing out a plan on graph paper. 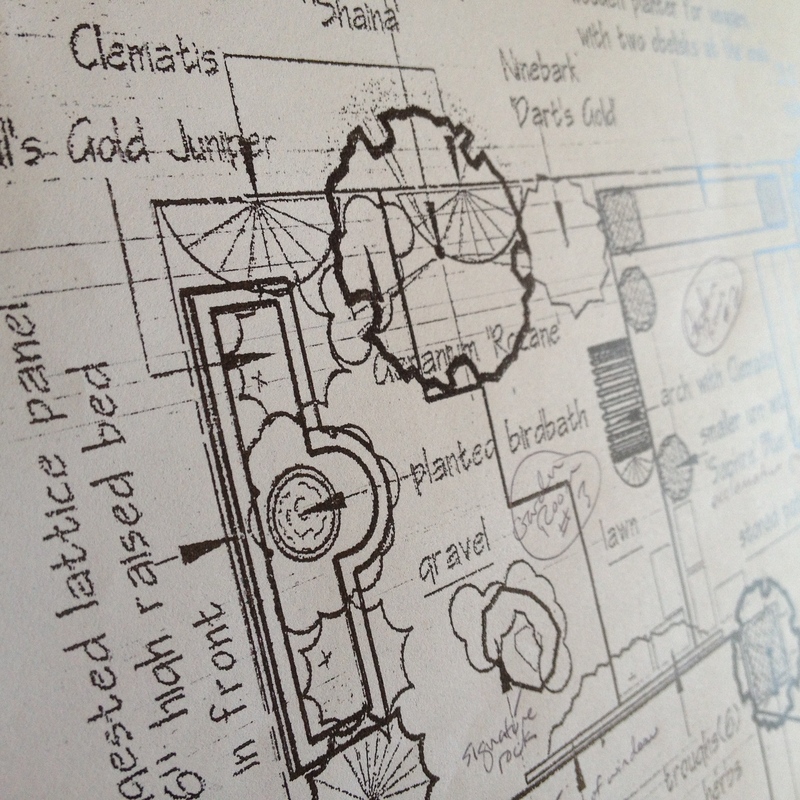 Check out professional garden plans available through nursery websites to get familiar with how plans look, how features are placed and the proportions of a garden. For two large Ontario-based nurseries with extensive online resources, try Humber Nurseries’ large variety of free plans and Sheridan Nurseries landscape plans. Figure out a new path by laying down a garden hose to trace the sides of the path, draw the outline of the path using a can of spray paint or, (my favourite), take a good look at the paths you’ve made through the snow. These are “desire lines”. Why ignore them? You can also take advantage of the first light snowfall in the fall. Use a broom to sweep away the snow, revealing your new path design. The true dimensions of your house, garage, driveway, etc. Don’t bother measuring everything; use your legal survey. All outdoor furniture, the barbecue, etc. You don’t want to build a patio only to find you can’t fit all the chairs around your patio table, for instance. If you don’t have the furniture yet, decide what you like and measure the pieces in the showroom or take them from the website. If you get a chance to attend a workshop, class or garden tour helmed by Mr. Kershaw, jump at it. He’s a walking fountain of design ideas, plant knowledge, gardening short-cuts and ways to look at your own garden differently. Here are some more ideas from the man for the fall garden. And check out the Toronto Botanical Garden website for a series of garden tours led by Mr. Kershaw in Summer 2015. Good ideas for schematic design, but not really how formal design courses are taught or even site analysis documentation. Most use computers now too for the development drawings to final. I agree. But Mr. Kershaw was aiming at covering all the basics of garden design in just two hours, from style inspirations to researching legal requirements of building a deck to taking into account plant health. For curious gardeners, I believe it was an excellent introduction to garden design in general (as was promised) and most importantly, I think it got everyone in the room thinking differently about their own gardens.